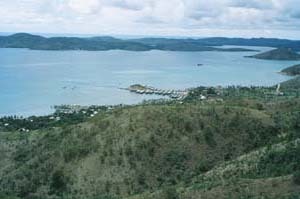 Port Moresby lies on the southeast shore of Papua New Guinea and is built around Fairfax Harbour, the island's largest harbour. As the city capital and administrative centre of PNG, it has the greatest population density in the country. 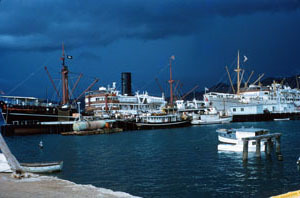 During World War 2 Port Moresby was coveted by both sides for control of the Coral Sea and the South Pacific Ocean. The Allies defeated Japanese naval forces destined for Port Moresby in the 1942 Battle of the Coral Sea. 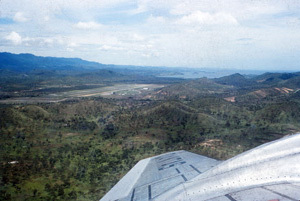 The area became a major American and Australian staging area and airfield complex in support of the Allied push to the north of New Guinea. Japan suffered a further blow in 1942 when they were routed on the Owen Stanley Range. Harbour defences consisted of several army batteries and a naval anti-submarine indicator loop installation. This webpage is mostly concerned with the Indicator Loops. The 'Loops' are long lengths of armoured cables laid on the seabed in shipping channels designed to detect submarines passing overhead. More details of how they work can be found on my How an Indicator Loop works webpage. Other Loop installations can be seen on the Indicator Loops around the World (Home Page). Thank you to John Douglas and Kell Nielsen for supplying many photos and captions for this webpage. These photos are copyright. For enquiries abou reuse contact John at dougal@daltron.com.pg and Kell at kell749@hotmail.com. In 1873 and 1875 Captain John Moresby RN (later Admiral) aboard the 'old-fashioned paddler' HMS Basilisk wrote of his expeditions in New Guinea on behalf of the British Admiralty. The names "Moresby" and "Basilisk" are synonymous with Papua New Guinea today and his report makes interesting reading. During the survey of the southern coast he discovered the harbour which he named Fairfax after his father Admiral Fairfax Moresby. 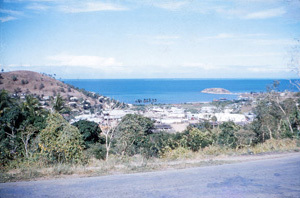 The town established there, based on already existing native villages (principally Hanuabada) was named Port Moresby and is now the nation's capital. John Moresby was also searching for a shorter route between Australia and China and on the eastern tip of the island he discovered the China Straits. He continued exploring along the north west coast as far as the Huon Gulf. For your information, I have attached selected parts of his second paper "Discoveries in Eastern New Guinea" related to Port Moresby itself, taken from the Journal of the Royal Geographical Society of London, Vol. 45 (1875), pp. 153-170. 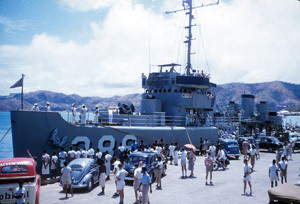 Port Moresby saw little of the Navy in the 1930s - usually just the one visit by the Australian Squadron in September each year. Not all of the squadron would come to Port Moresby, usually just one or two while the others visited other ports (Rabaul, Darwin etc). For example, in 1930 Rear Admiral E. R. G. R. Evans brought the flagship HMAS Australia and aircraft carrier HMAS Albatross for a winter visit from 11-13 September. In 1932, the Spring cruise of the squadron saw the cruiser HMAS Australia and the destroyer HMAS Tattoo drop in. For the Spring cruises in 1935 and 1936 HMAS Canberra, flagship of Rear Adm W. T. R Ford (1935) and Rear Adm R. H. O Lane-Poole (1936) had five-day visits in September but there was little else until the following year. Of major significance to the defence of Papua and New Guinea was the volcanic eruption on Baluan Island at Rabaul, New Guinea's capital on the 31st May 1937. Blanche Bay at Rabaul was said to be a 'sea of terror'. With the death of 400 residents, the Australian Government had to decide the fate of the town. The Australian Governor General Lord Gowrie and Lady Gowrie aboard HMAS Australia had a timely visit in a month later. The Government announced that the two territories - Papua and New Guinea - would be amalgamated and Port Moresby would be the capital. Under the Mandate that covered New Guinea, Australia was not permitted to build defence installations in New Guinea but under amalgamation it could be defended from fortifications in Papua. 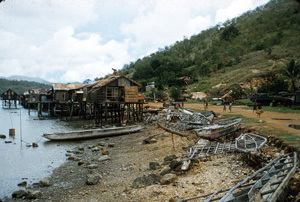 To strengthen defences, more information about the Port Moresby harbour was needed. On 10th October 1936 1936 Lt Cmr Robert Bagster Atlee Hunt (RAN) from the Hydrographic Branch arrived in Port Moresby aboard the surveying ship HMAS Moresby to make a detailed survey of the approaches to the harbour. This map was of vital importance in the coming war and was considered to be of such a high standard that the approaches were not resurveyed until 1996. Lt Cmr Hunt folowed this up with a survey of the approaches to Port Darwin before returning to Sydney. Land was also surveyed at Port Moresby by military officers and was resumed for defence purposes. 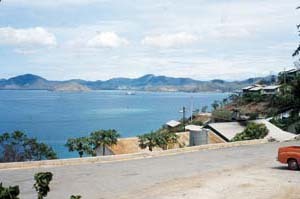 As the threat of Japanese expansion in the area to the north of Australia became more apparent, Australian and British planners decided upon constructing a battery on Paga Hill in Port Moresby. This had been planned for in the interwar period and land had been set aside but more pressing use of the money was found. On December 6, 1938, the the new Australian Minister for Defence, Brigadier Street, announced funding for Port Moresby: for fixed defences, a flying boat station and a naval (fuelling) base from which cruisers and small craft could operate. This was part of a Â£63 million plan to rearm Australia by 1940-41. In 1939 when war broke out in Europe, construction of Paga Hill gun battery construction recommenced in earnest. Two six inch coastal guns were installed and work continued on the supporting infrastructure (magazines, access tunnels, observation posts etc). 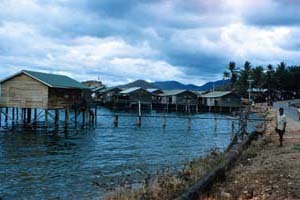 Since the greater part of Papua New Guinea was uninhabited, the communications facilities were naturally poor and the roads were not extensive. The total length was only 136 miles (approximately 218 kilometers) of which 109 miles was in the Central Province, 16 miles in the Eastern Province, and 11 miles in Southeastern Province. These roads only connected the villages in the vicinity of the coast. Nevertheless, prior to Japan's entry into the war in 1941, Port Moresby was still a small administrative town with about 3000 residents including 2000 natives and 800 Europeans (mainly Australians). There were about 50 military vehicles and 200 cars in use (but no buses). 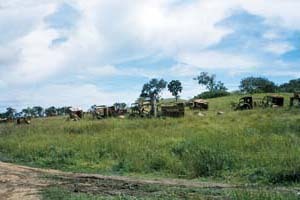 As it is today, Port Moresby was dry for the period of eight months between June and January each year and the rainfall is very small. 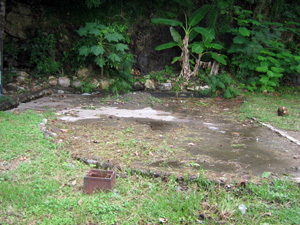 The locals depended on rainfall and sometimes had to transport water from other areas. The Government has constructed water storage tanks with galvanized iron roofs for use during droughts southwest of Tuaguba Hill. In March 1939, Major Kenneth Drummond Chalmers arrived in Port Moresby with a subordinate officer and 38 men of 13th Heavy Battery of the Royal Australian Artillery, to assume the position of officer commanding Port Moresby harbour defences. 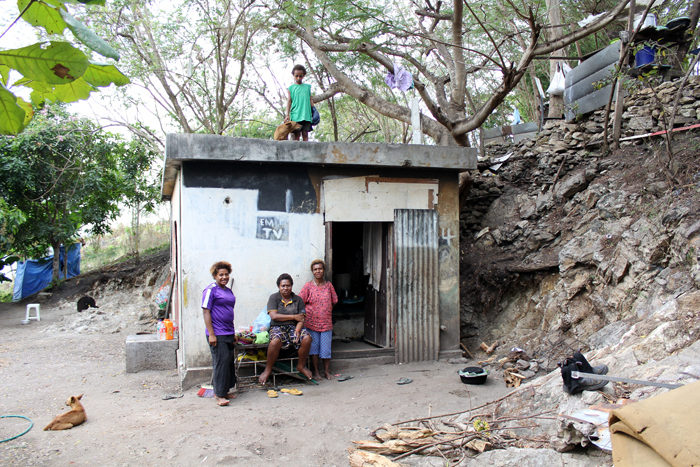 They established a permanent settlement at Paga Point in Port Moresby. They constructed an extension to the road (Chalmers Crescent) around Paga Hill and right up to the 110 metre high crest of the hill. A gun emplacement was built that commanded the approaches to Basilisk Passage, the main shipping route through the reef to Port Moresby harbour (see map below). The guns of Port Moresby are discussed in more detail at my Port Moresby Coastal Battery page. The history of the Paga Hill Battery can also be found there. For more on the role of the 53 Battalion at Port Moresby see 53 Battalion webpage. After the outbreak of the European war with Germany in September 1939, life hardly changed in Port Moresby, or in Papua and New Guinea for that matter. 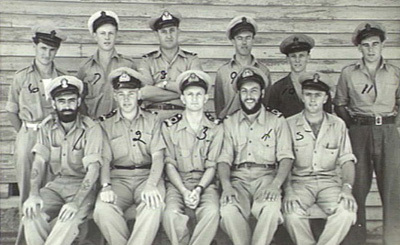 In July 1940, a detatchment of 150 men from a Queensland militia unit was sent to Port Moresby, and they were joined by small naval and airforce units. This was followed up with a visit to Port Moresby by the cruiser HMAS Canberra on 18 August 1939. On 10th September 1940 the Naval Board (of the Royal Australian Navy) wrote to the Naval Officer In Charge at Port Moresby asking for his recommendation about naval defences. He wrote back on 13th September recommending a minesweeping unit of 2 vessels, an anti-submarine unit of 3 vessels and a series of minefields. He also recommended that the guns be modified (to a 20Âº mounting, if nothing else) and extra searchlight to cover the minefield. The minefields proposed were: Entrance to Bootless Inlet, Pyramid Point to reef, the anchorage off Porebada (Haidana Island) and, when necessary, Baselisk Passage. By this they meant that when intelligence suggests an naval attack on Port Moresby is imminent. On February 11, 1941, In response to the ominous signs that Japan was preparing for military aggression in the South-West Pacific region, the Australian Federal Opposition leader John Curtin weighed into the debate with a public call for strengthening of defences at Darwin and Port Moresby. The Australian government undertook a rapid expansion of Australia's volunteer Citizen Military Forces - the 'militia' - for the defence of the Australian mainland and overseas territories. Although liable to be called up to defend Australia, these militia troops were inadequately trained, and lacked adequate equipment and weapons. One-thousand garrison troops - a company of the 49th Battalion of the Australian Military Forces - arrived in March 1941 without the most basic infantry equipment. The 49th had been raised from conscripts in Queensland for "tropical service" in February 1941 and sailed to the islands in the Torres Strait where some disembarked for garrison duty at Thursday Island. 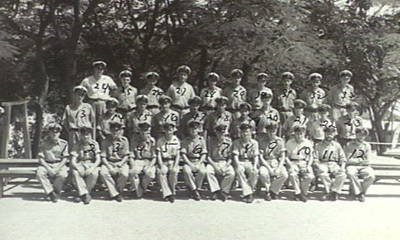 The rest of the battalion arrived in Port Moresby in March. The battalion undertook little training once in Port Moresby and mainly provided labour for working parties and unloaded shipsâ€™ stores at the expense of weapon and infantry training, cohesion, morale and discipline. During this time the 49thâ€™s morale was low and had reportedly the worst discipline in Moresby. It is fair to say that they were young (the average age of these militia recruits was 18Â½ years) and poorly trained. They placed a heavy burden on the town. The 39th and 53rd Battalions were raised in Australia, departed Sydney 27th December 1941 on the Aquitania and reached Port Moresby on 3rd January 1942 to form the 30th Brigade commanded by Major General Basil Moorhouse Morris, Commander of the 8th Military District. They they could not immediately be fed and sheltered because their food supplies and camping equipment had been stowed at the bottom of the ship's hold. Many of the raw recruits of the 53rd Battalion had never handled a rifle until they were put on board the ship bound for Port Moresby. 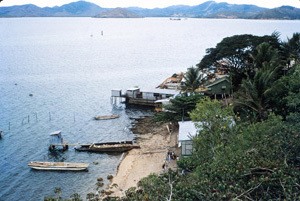 The 53rd battalion was assigned to the Napa Napa peninsula, an arid strip of stony, timbered hills and mosquito-infested mangrove swamps on the remote western side of Port Moresby harbour. Until Japan invaded New Guinea in 1942 the responsibility for the defence of Port Moresby was tasked to these battalions where they would play a critical and heroic role in delaying the momentum of the Japanese advance. 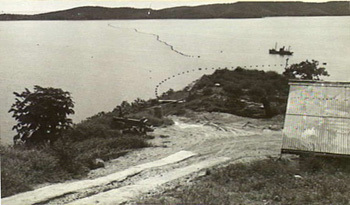 In July 1941 Menzies informed the public that the first minefield of the war was to be laid in the approaches to Port Moresby. But, to the Navy, this was not enough. Other ports needed defending. When the Labor Government under Prime Minister Curtin assumed office in October 1941 another 2000 mines were ordered for the eastern seaboard of Australia (Sydney, Newcastle, Brisbane...). 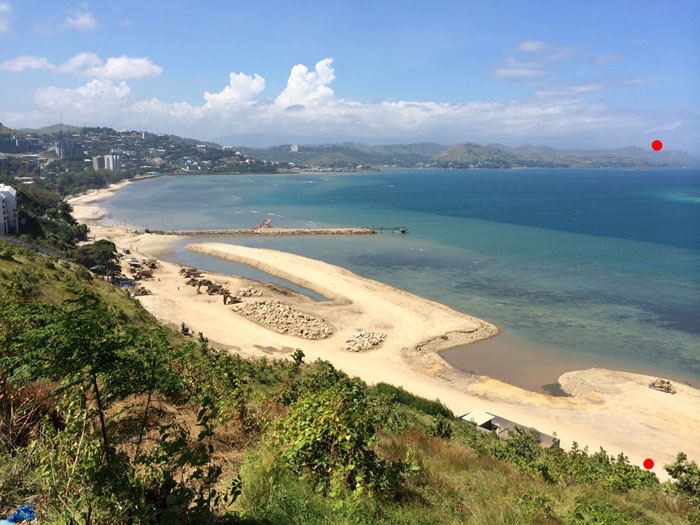 (1) General Condition of Harbor and City: Port Moresby has a good, wide harbor, and the bay is entered by passing between Hanudamava Island (at the mouth of the harbor) and Bogirohodobi Point, approximately 1.5 miles (2400m) to the east. At the beginning of 1940 there were approximately 800 Europeans, approximately 20 Chinese, and no Japanese residents. The natives (approximately 2000) have built their village over the water and live apart from the white residents. The city is situated between Tuaguba Hill and Ela [Paga] Hill on the eastern shore of the harbor, and is the center of the government, military affairs, economics, transportation, communications, etc. 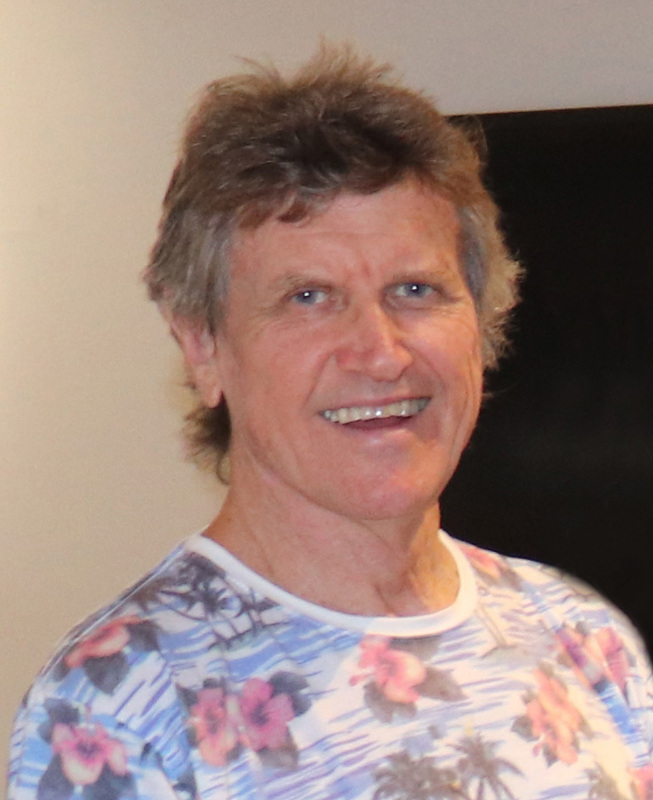 of Australian-controlled New Guinea. There are various offices, including government offices and branch offices, a radio station, a government-managed electric power plant, church, school, European and native hospitals, an ice plant, bank, hotels, etc. (2) Value of Port Moresby as a Naval Base: Although the harbor is rather small for a fleet base, it is fairly deep (maximum 10 fathoms), and the bottom is alluvial soil, and one or two squadrons could anchor without difficulty. A space between the coral reefs outside of the harbor offers a very wide anchoring place, large enough for a large fleet to anchor. However, installations for repairs and supply have not been fully established, so it is valuable only as a port of call. (3) Military Preparations: Information obtained by observation of the actual area follows: (a) Garrison Strength: Army: There is a barracks at Granville East (approximately 1 kilometer northeast of the city), which, judging from its size and the amount of equipment, can accommodate approximately 1,000 men. The present garrison appears to be composed wholly of infantry troops, without artillery. 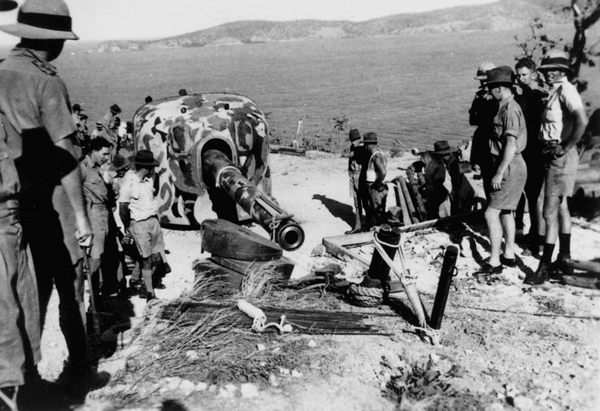 Others: A Royal Australian Artillery Detachment (2 Officers, 38 non-commissioned officers, and privates, who arrived with 6-inch guns) apparently is stationed on Ela Hill and will be reinforced, judging from the fact that the number of barracks on the hill is being increased. Navy: The strength is not known but appears to be about 30 men. The orderly room is located at the side of the government pier. The station ship has not been identified; only 2 or 3 launches have been identified. (b) Installations: A road for military use has been built to the top of Ela Hill, and two 6-inch guns are placed on top of this hill. The main line of fire of these guns apparently is directed toward Basilisk Passage. The guns are exposed on top of the hill. According to information, they will be increased by two more guns. In addition to the Kila Kila airfield, approximately 4 kilometers east of Port Moresby, an airfield for military use, approximately 11 kilometers from Port Moresby (location unknown), is expected to be constructed. 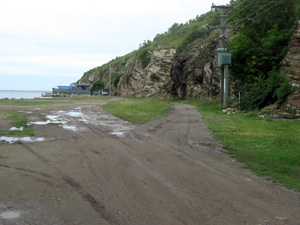 A single road parallel to the coastal highÂ­way, and halfway up the hill of Tuaguba, is being constructed. (4) Passage of channels: The greatest difficulty in a landing operation at Port Moresby would be passing through the waterways. 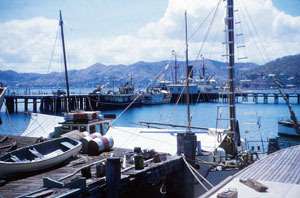 There are three channels entering the harbor of Port Moresby. Liljeblad Passage, on the extreme west, has a very strong current and shoals. This passage cannot be used in general because there are shallows before the mouth of the harbor. Therefore, it is difficult to enter this passage. Basilisk Passage, in the center, is the channel used by vessels at present, but it is about 6 kilometers from the gun emplacement on Ela Hill and thus is within the guns' effective range. In general, unless the gun emplacement is destroyed, it would be difficult to enter through this channel. Padana Nahua, at the extreme east, is quite wide (about 900 meters and is outside the effective range of the gun emplacement (about 18,000 meters). This channel should be selected for an entrance. However, all three waterways are neither very deep nor wide, and could easily be covered with mines and other obstacles. These obstacles must be cleared first of all. If a place where the Nateara and Sinavi coral reefs can be passed over with boats could be found, then an approach could be made without risking the danger of passing through the channel. Anchoring outside a coral reef is very difficult, so in such a case the transfer to boats would have to be made while drifting. What is interesting is the lack of commentary on the possible use of Indicator Loops. There is no evidence that Japan knew of the planned use of Loops by the allies prior to WW2. It wasn't until the Japanese captured Penang that they realised that the harbour defences installed there were unknown devices the British called indicator loops. 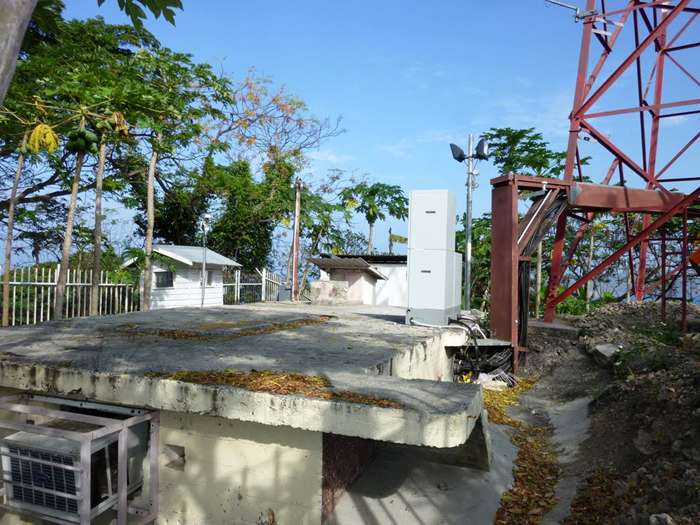 There were four coastal batteries protecting Port Moresby: Basilisk Battery (Idlers Bay), Gemo Island Battery, Paga Hill Battery, and Bootless Bay Battery. 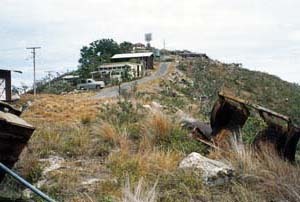 The current state of the batteries can be found at Port Moresby Coastal Batteries. It was the Paga Hill Battery that covered Basilisk Passage where the loops were located. 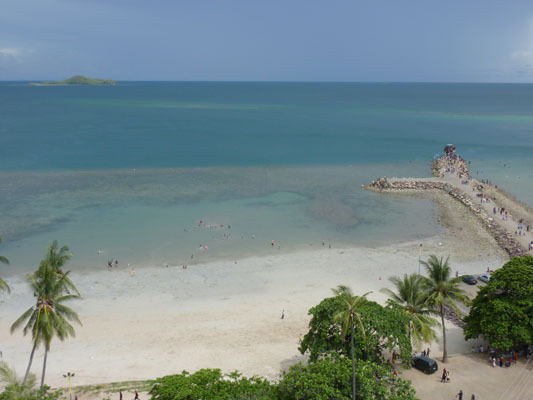 Port Moresby harbour is protected from the open sea by a barrier reef that extends right along the coastline of Port Moresby and the land to the west and east. South-west of the city is an island called Daugo (Fishermen's) Island and outside this, a reef called Sinavi Reef. This reef makes up the western barrier to the harbour and is also the western side of the main entrance to the harbour, Basilisk Passage. On the 2nd September 1939 - one day before war with Germany was declared - the Admiralty warned the Australian Navy Office of the deteriorating situation with Germany and the RAN immediately began an Examination Service at all capital city ports, and at Darwin, Newcastle and Port Moresby. Vessels about to enter a defended port would be stopped by the Examination Service steamer under guns of the shore batteries, and identified before being given permission to enter. 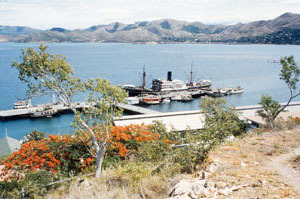 This was the start of Port Moresby's naval defences. 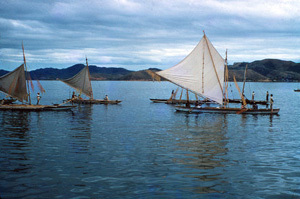 However, Port Moresby was without passive harbour defences such as antisubmarine nets, booms, indicator loops or mines up until the entry of Japan into the war. Preparation for defensive minefields in Australia and its neighbours to meet an Eastern (Japanese) war began much earlier. The Admiralty replied that it would be available at the end of December 1941 but Port Moresby would have to wait until the Darwin loops had been relaid. In October and November 1941, the Navy laid additional fields in Torres Strait and in passages through the Barrier reef. The antisubmarine school HMAS Rushcutter had been instructed to begin planning for the deployment of loops at Port Moresby. This was prior to Japan's attack on Pearl Harbor and the beginning of the war in the Pacific. Soon after the entry of Japan into the war on 8th December 1941, Port Moresby defences were strengthened by the appointment (on 29th January 1942) of Commander Robert B. A. Hunt OBE of the Royal Australian Navy as Naval Officer in Charge (NOIC) of Port Moresby and Acting Commander (see photo below). Hunt was a 41 year old highly experienced officer in charge of the Hydrographic Depot at HMAS Penguin in Sydney. He was a career naval officer starting as a cadet midshipman in 1914. He had only just completed a hydrographic survey of the New South Wales coast and more importantly, in 1937, of Port Moresby harbour. With the United States arriving in Australia in early 1942, a reconsideration of seacoast defences was vital. Vice Admiral Herbert F. Leary, commander of Allied Naval Forces in the Command HQ SWPA requested a report on the reinforcement of seacoast defences and this was undertaken by Major General J. S. Whitelaw MGRA, Australian Army, Capt. H. J. Ray USN, Staff Officer, HQ SWPA, and Cmr H. J. Buchanan, RAN. Their report of 18 May 1942 recommended, for Port Moresby, an advanced air base to supplement the 2 x 6" guns at Basilisk Battery, Paga Hill. They also recommended the following antisubmarine defences: controlled minefields for Pyramid Point (at the west entrance of Bootless Bay Inlet) and west of Hanudamava Island (now known as Gemo Island) and for contact mines at Bootless Point (an inlet to the east of Port Moresby). They also recommended that the installation of indicator loops to cover Basilisk Passage: 3 loops surrounding Lark Patch in water between 6 fathoms and 15 fathoms. 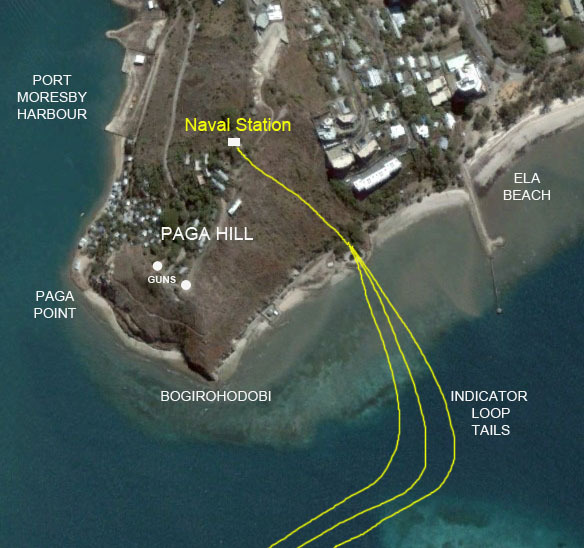 Buchanan asked that the NOIC Port Moresby select a site for the Loop Control Hut - suggesting either Paga Hill or Water Catchment Hill (Tuaguba Hill). He also said that the hut should be at least 200 yards from the guns to prevent ground vibrations. Lastly, Buchanan asked that a site be selected for the landing of the loop tails. He said that in the vicinity of the Native Hospitals or Ela Beach may be suitable. The Naval Board also wanted 2 Harbour Defence Asdics to be laid: No.1 at 149° off Bogirohodobi at a distance of 1.82 nm, and No. 2 at 249° off Paga Point at 0.75 nm. [1855/3/230, 12 May 1942]. 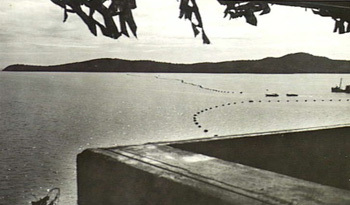 The appearance of the Japanese submarine I-22 off Port Moresby on 4 May 1942 (after her efforts at Pearl Harbor and while on her way to the Coral Sea for battle) was insufficient to raise the priority of loop installations in Port Moresby harbour (Basilisk Passage). Nevertheless, cable and instruments were ordered with an expected delivery date of September/October 1942 (see below). 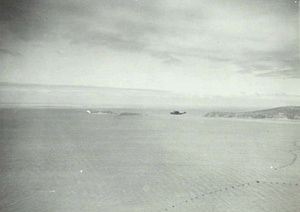 However the detection of Japanese submarine RO33 off Port Moresby (and the successful attack by HMAS Arunta on 29 August 1942) made the need for passive harbour defences imperative and the loop laying program began in earnest. 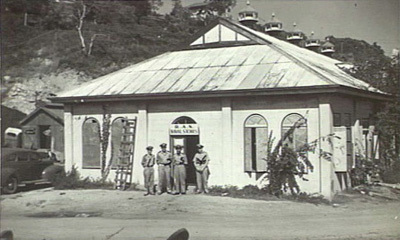 In September 1942 the NOIC Port Moresby wrote to the Naval Board saying that the only practicable site for a Control Hut was at the old Port War Signal Station on Paga Hill. The NOIC said that a good concrete structure exists (the Army's Close Defence Battery Command Post - CDBOP) and it wasn't being used. So, the Naval Board wrote to the Army (18 September 1942) requesting the CDBOP and received a terse reply from the Army 6 days later saying that the reason it is not being used is because they are waiting for the Radar (RDF) equipment which was currently in transit to Port Moresby. So the NOIC had to find somewhere else. 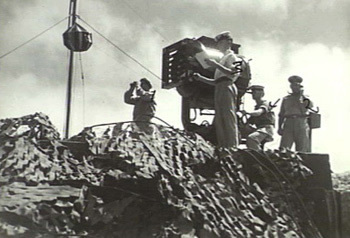 On 2 November 1942 Commander HJ Buchanan and Engineer Commander CW Bridge visited Paga Hill and selected a site further up the hill. 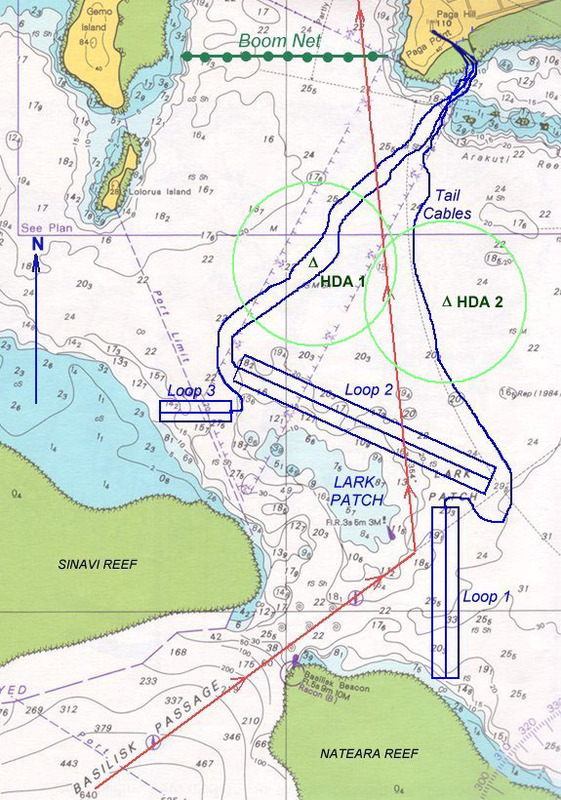 Three Indicator Loops (Type 803) and two Harbour Defence Asdics (HDAs) were thus planned for Port Moresby (Operation 'Silver'). On 31 Jan 1943 it was decided to postpone the laying of the HDAs and to lay only the three loops. 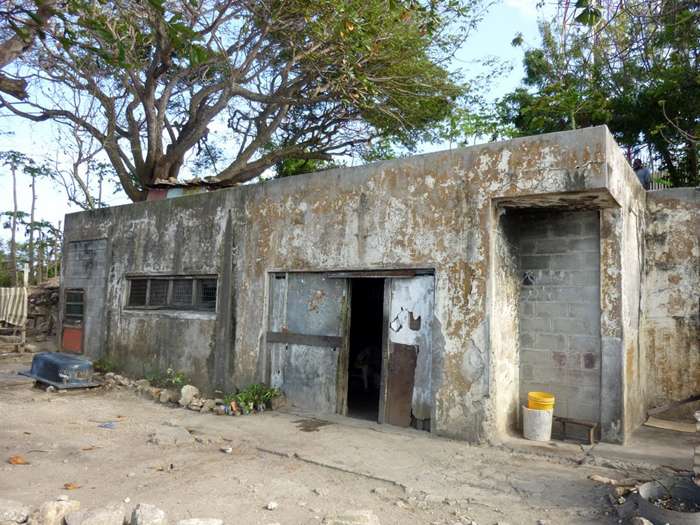 The Loop Control station was to be constructed at the top of Paga Hill and the loop tails were to come ashore to a "Link Hut" at Bogirohodobi at the base of Paga Hill. The cable ship HMAS Bangalow, under the command of Lt F. C. Audall RANR (S), arrived on 25 March 1943 and laid the three loops and this was completed on 12 April 1943. To set the loops in correct position, their placement was triangulated from three marker flags: one on Kila Kila Hill to the east, one on Paga Hill (HMAS Basilisk flagstaff) and one was placed on top of the hill on Gemo Island. The Basilisk Beacon on Nateara Reef was also used. The position of the loops as shown on RAN charts is depicted on the map below. The loop station was set up by 28 year-old A/S Officer Lt Edgar Dillon RANVR (the Port A/S Officer at HMAS Basilisk shore station) and they were ready for operation on 16th Nov 1943. 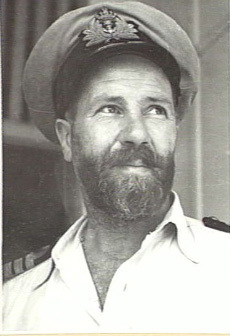 Dillon had been an Instructor at the HMAS Rushcutter Anti-submarine school in Sydney since May 1941 and this was his first posting. He graduated with 'above average ability' in February 1941 and by February 1943 had also completed qualifications with distinction in Navigation and Fairmiles at the Fairmile School (at HMAS Rushcutter). It was usual practice to send one of the A/S Instructors from HMAS Rushcutter to set up the Loop Station and oversee the installation of the recording equipment and the connections of the tails to the instruments inside the hut. 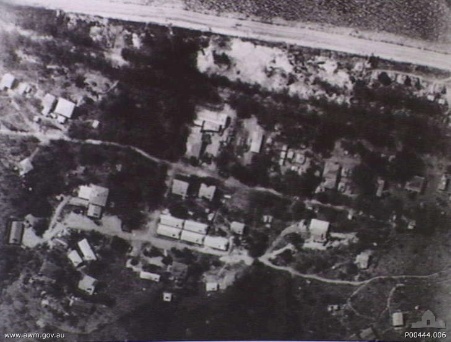 Aerial photo of the Naval Station (and Loop Hut) location on Paga Hill. The loop "tail" cables came in about 350 m from the point known as Bogirohodobi. The rock jetty up near Ela Beach is a later construction. 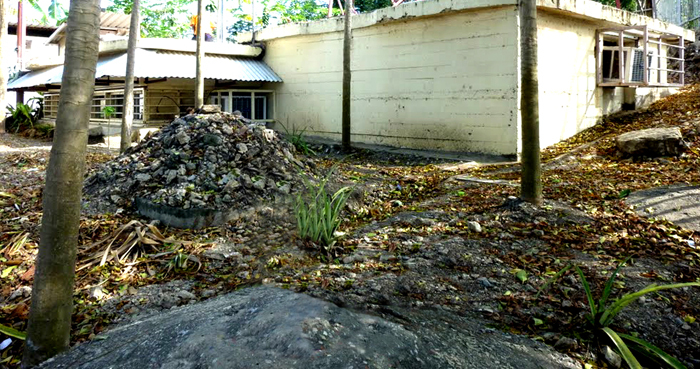 A concrete pad at Bogirohodobi at the base of Paga Hill. This was most likely the "Link Hut" for the indicator loops. The cables came ashore and were connected to the land cables inside this hut. The cables were taken up the hill to the loop hut in trenches about 2 foot deep. 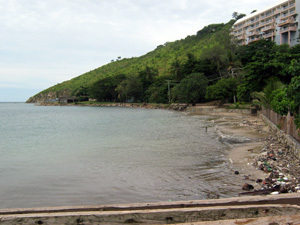 The flat area at the base of Paga Point (known as Bogirohodobi) where the cables came ashore. This area is now 'down-town' and has been much built on in the past 65 years. 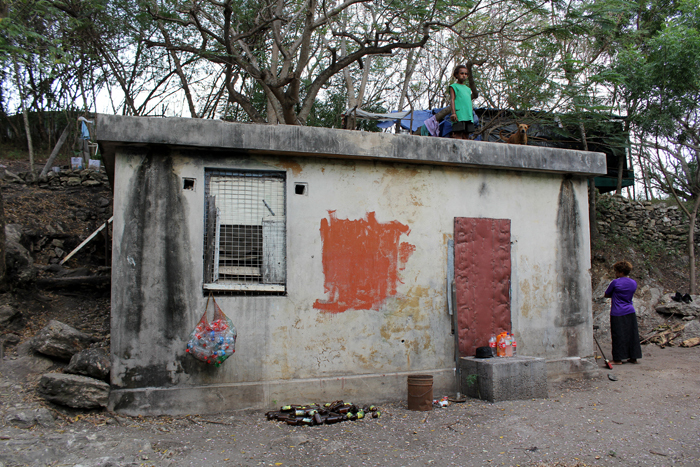 A continuation of the coastal terrace (Bramell Street) towards Paga Point. The blue building in the distance is the Seaworld complex. Paga Hill (looking west towards Paga Point) taken from the [post war] pier in Walter Bay. This is where the tail cables came ashore. 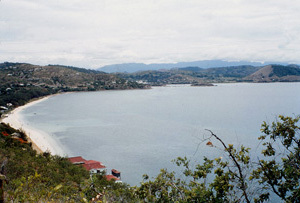 Overlooking the loop area with Ela Beach in the foreground and Sea Palk Walkway to the right. Photo taken by Paul Bryant in 2010 from his flash unit in Armit Street overlooking the beach. This picture of Ela Beach was taken on Saturday 10 May 2014. As you can see from this picture work is well and truly under way to cut the top off Paga Hill. The red dot to the lower right marks the location of the old Native Hospital (an American Officers' Club during WWII). There are no squatters to evict from their homes around this side so work is progressing quickly. However, it is not so simple around where the Gun emplacements are. Police and native squatters are locked in a constant battle as the police are trying to move them on. Visitors and sightseers are finding it difficult to move around the site freely. The second red dot (top right) is the location of the nun emplacements at Drysdale Ridge. 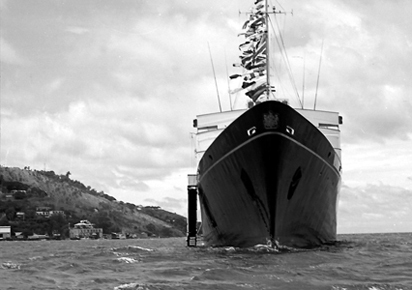 The Royal Yacht Britannia moored off Paga Point during the Queen's visit in 1974. You can see the naval buildings on the waterfront to the left. They are also enlarged in the photo below. Photo by Kell Nielsen. The Britannia was moored only a few hundred meters out from Kell's wharf site office, hence the many photos of the Royal visit. Once the loops were installed an experienced antisubmarine officer was required; one conversant with indicator loops, controlled mines and Asdics. Such a person was Lt Cmr Arnold Beverley Smith who had completed the first A/S Short Course at Rushcutter in 1940. Smith was Extended Defence Officer (EDO) and Officer in Charge (OIC) of Seaward Defences (Indicator Loops) at HMAS Melville (Darwin) and was transferred to HMAS Basilisk (on 27 July 1943) as EDO and OIC of the Seaward Defences (that is, the Loop station and controlled mines). It was now time for Cmr Hunt - the NOIC Port Moresby - to be shipped out (on 30 August 1943) and he was appointed Commander in Charge of the Survey and Hydrographic Branch of the RAN. Lt Cmr Smith was quite a character and fellow officers enjoyed his company [Recollections of Lt Syd Sharp RANVR, A/S Officer at HMAS Melville (Darwin) when Smith was NOIC]. Lt Cmr Smith was born in Toronto, Canada in 1901 so, at 42 years old, he was quite old for A/S deployment. Most of the A/S officers were in their mid-20s. He was quite proud of the fact that while in Canada he used to run alcohol down from Canada to the US where prohibition was in full swing. His health wasn't the best and he was transferred back to Rushcutter in May 1944. Lt A. G. Stephen, who had been at Basilisk since 19 March 1944 as Controlled Mining Officer was appointed EDO and OIC Seaward Defences in Smith's place on 1 May 1944. He continued in this role until 1 September 1945. Meanwhile, Lt Cmr Lawrence Edwin Hinchliffe RANR, who was Supply Officer at Basilisk (since 4 January 1944) was appointed Commander and NOIC Port Moresby effective from 3 July 1944 until 31 May 1945 when Basilisk was decommissioned. Lt Cmr Smith applied to be discharged from the RAN in 1945 (which was granted) but he died the next year of chronic rheumatic endocarditis with hypertension. On 29 May 1945 it was decided to raise the loops and this was completed by HMAS Limosa on 8 Aug 1945. HMAS Basilisk was paid off on 17 December 1945. The station was dismantled and personnel withdrawn. As a matter of interest, HMAS Basilisk was re-commissioned under Cmr P. Paffard, RAN on 14 November 1974. The naval base was decommissioned in 1983. The lengths of the three loops (1, 2 and 3) were respectively as follows: 1900 yds, 2750 yds, 1200 yds. They were all 400 yds wide (that is, 200 yds between legs). The tails were 6500 yds, 9000 yds and 4500 yds respectively. In all, 20000 yds of lead loaded loop cable (Adm Patt 1989) and 15000 yds of tail cable (Adm Patt 7048) was required. To see a description of these cable types go to my Cablemakers web page. The cable was sent from England aboard four different ships (Perseus, Forsdale, Gloucester and Tongariro) and the galvanometers (integrators) aboard SS City of Lyons. It was hoped the equipment would arrive by October 1942, and it did. The rest of the equipment was made locally. Reference: MP1587/1 355K, Order No. 3739 1 July 1942. The Navy Office also planned to install two Harbour Defence Asdics (HDAs) which would have also required 9000 yds of HDA cable. However, this plan was cancelled on 19 February 1943. On the map above, I have shown the most likely locations for the two HDAs. The HDA is a special sea-bed mounted form of the ship-borne Asdic (now known as sonar). As with modern sonar, an oscillator (set in 'transmit' mode) sends out a short pulse of sound at about 15 kHz ( a 'ping') which would reflect off any large object in its beam. The resulting echo could be detected by the underwater oscillator (in 'receive' mode). The pattern of echoes could indicate position and speed of a ship. The duration of the 'ping' was 3/100ths of a second. The speed of sound in water is 5000 ft/second (at 20Â°C and 3.5% salinity) which enables the sound to travel 2500 yards and return in the 3 seconds before the next ping. This is the maximum range for detection any echo. The sound beam sent out by the oscillator was conical in shape (about 16Â° divergence). The cone pointed away from the transmitting ship, which meant that the area covered by the Asdic beams widened with the distance. Within the range of the Asdic, the father away a submarine was from the hunter ship, the more likely it was to be spotted. On the map above I have placed the HDAs about 1500 yards on the harbour side of the loop and before the boom. This is the usual practice. If a enemy ship is detected on the loop, the officer in the loop hut would have his HSDs (Higher Submarine Detectors, that is Naval Ratings with higher levels of A/S qualifications) begin to 'ping' the shipping channel. The green circles on the map above show the effective range of the HDAs even though they could detect out to twice this radial distance. However, the HDAs were never installed. There were two installed in Moreton Bay (Brisbane) and one in Sydney. Ship-borne Asdics were more useful as they could be used for attack (and depth charging). The Indicator Loops and emergency lighting was to be powered by two separate generators in separate buildings. The foundations cannot be found but would have been about 100 m to the east and west of the Loop Control Station. Each building was connected to the 240V mains supply but the prime mover was a diesel engine coupled through a "V" belt drive to a double-ended generator producing 110V DC and 110V AC at 1Â½ kW (for the loops) and 220V DC at 6kW for the HDA (although this was never installed). The 110V DC provided power for a bank of lead-acid batteries, which in turn supplied the rotary convertor (Â¼ kW) for the Indicator Loop equipment. To staff the IL station, 4 A/S officers, 1 petty officer, 3 leading seamen, 12 AB seamen, 4 AB seamen for radio transmitter and 1 Electrical Artificer were sent. This was in addition to mining officers. Other staff were also sent as shown by the photos below. The names of the Ratings are unknown at present but it is certain they all would have had antisubmarine training at Rushcutter and thus be classified as "SD" (Submarine Detectors). At least two would have been classified "HSD" or Higher Submarine Detectors and would have undergone extra training to be competent with the Harbour Defence Asdics. Ony two of the officers had antisubmarine training at Rushcutter: Lt R. J. Eddington and Lt A. B. Smith. Lt Wyllie had training in "production" at Rushcutter but his harbour defence training was in Controlled Mining. The Commanding Officer and Officers of HMAS Basilisk and The Naval Officer-in-Charge, Port Moresby Staff. Paymaster Lt F.C. Birch (1); Lt R.J. Eddington (2); Warrant Officer Money (3); Sub Lt N.H. Reynolds (4); Warrant Mechanician J. Sibun (5); Warrant Officer Douglas (6); Paymaster Lt D.J. Wyles (7); Lt H.C. Wyllie (8); Lt G.F. Amsberg (9); Lt A.G. Stephen (10); Paymaster Sub Lt K.P. Ryan (11); Lt J. Dow (12); Lt W. Drysdale (13); Warrant Supply Officer A. Salway (14); Lt J.B. Marshall (15); Warrant Officer Mckenzie (16); Lt M.W. Mathers (17); Engineer Lt Cmr J. Munro (18); Lt Commander Lawrence E. Hinchcliffe (19); Paymaster Lt Cmr R.T. Bennetts (20); Lt G.R. Orr (21). AWM 074857. 28 July 1943. Note: only Eddington and Wyllie had A/S training. 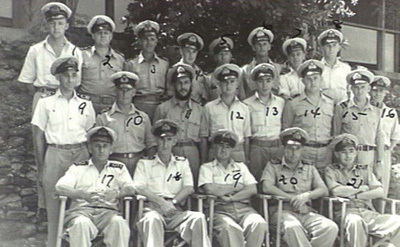 Staff of the RAN Base Store, HMAS Basilisk. Petty Officer Honeysett (1); Pay Sub Lieutenant J. Balmer (2); Pay Lieutenant T.W. Slade (3); Pay Sub Lieutenant K.P. Ryan (4); Petty Officer Hood (5); Stores Assistant Murname (6); Stores Assistant Crane (7); Warrant Supply Officer Salway (8); Warrant Stores Officer L.S.A. Tirzaker (9); Stores Assistant Watson (10); Leading Stores Assistant Aberle (11). AWM 074850. 28 July 1943. Ratings of the Miscellaneous Division of the RAN Shore Station, The HMAS Basilisk. AWM 074863. Eddington, Raymond Jack, b 23 Jun 1904 Hobart, enlisted RAAF 10 Dec 1942 (Sgt) and transferred to RANVR at Fremantle and promoted to Sub Lt on 1 July 1943. Attended Indicator Loop Course at HMAS Rushcutter on 9 Aug 1943 and on completion posted to HMAS Basilisk. Promoted to Lt on 29 Apr 1944 and then transferred to HMAS Magnetic (RAN 21 Port War Signal Station at Townsville, Queensland) on 29 July 1944. On 10 Aug 1944 was sent to HMAS Leewin (Fremantle, Western Australia) and became EXDO at Swanborne Indicator Loop Station (RAN 142) near Fremantle until end of war. Wyllie, Hugh Campion, b 25Apr 1905. Entered militia in 18 Jan 1939 but went straight to HMAS Rushcutter Indicator Loop course on 9 Aug 1943 after mobilization on 10 June 1943. Undertook a Controlled Mining course at Rushcutter from 31 Sep 1943 until his posting to HMAS Basilisk on 4 Jan 1944. He remained at Basilisk until 15 Sep 1944 when he was transferred to HMAS Melville (Darwin) as OIC Charts. Lt Commander Lawrence Edwin Charles Hinchcliffe, b 28 May 1908 in Sydney, appointed as Midshipman in 1926 and promoted to Lt Cmr RANR in 1938. He was mobilized on 12 Sep 1939 but in an unfortunate accident (off duty) in Greece on 28 Jan 1941 between a taxi in which he was travelling and a train, Hinchliffe suffered a fractured skull, was hospitalised, and was sent back to Australia to be stationed at HMAS Rushcutter (from 24 June 1941). He was certified as medically unfit for overseas service and suitable for home duties for the duration of the war. Hinchliffe was appointed to HMAS Basilisk (S. O. (O)) from 4 Jan 1944 and then became NOIC Port Moresby from 3 July 1944 until his departure in April 1945. He had no antisubmarine training. Engineer Lt Commander John Munro, b 4 June 1899 Scotland, Rushcutter 18 July 1941 Degaussing duties, HMAS Magnetic BEO, Basilisk BEO 11 Nov 1943. Lt George Frederick Amsberg, b 1905. Rushcutter for Sea Transport training (not Indicator Loops). Basilisk 1 July 43 to 21 Sep 1944. Lt Algernon Gordon Stephen, b 21 June 1892, Wallaroo, South Australia. Mobilized for Controlled Mining at Cerberus 24 Apr 1942, thence HMAS Magnetic (CM), HMAS Rushcutter (CM) at Botany Bay CM Station, Basilisk 19 March 1944 as EDO and OIC Seaward Defences at Basilisk; and from 1 May 1944 to 1 Sep 1945 was an A/S Instructor at Rushcutter. Lt John Archibald Dow, b 6 July 1919 Melbourne. Appointed HMAS Melville (Cyphers) 3 Jan 1942, then HMAS Moreton (Brisbane) from 16 July 1942 for Cyphers until 9 Sep 1943. From 10 Sep 1943 he was at Basilisk (Cyphers) and Air Liaison Officer (from 27 Nov 1944). Lt Geoffrey Robert Orr, b 5 May 1909, Basilisk (Operations) from 24 Sep 1943. Lt John Brodie Marshall, b 5 Nov 1899 Scotland, Basilisk, Boom Defence Officer (BDO) in command of Beryl II from 29 Dec 1943 to 1 Feb 1945. Lt Cmr Albert Edward Reginald Fox, b 28 Sep 1918, England. Basilisk 16 Jun 1943 to 30 Sep 1943 then Milne Bay. Base Signals Officer (BSO) on staff of NOIC Port Moresby. Sub Lt Noad Harvey Jackson Reynolds, b 24 Sep 1922 Victoria, 1 April 1944 Basilisk as Secretarial and Confidential Books (CBs) until 1 June 1945. Warrant Mechanician John Clifford Lewis Sibun (later Eng Lt Cmr), b 7 July 1899; stoker and then mechanic in interwar period, assistant to BEO Port Moresby 31 Jan 1943 to 8 Aug 1945. Warrant Officer Robert Leslie Douglas, b 1904, Boom Defence at Basilisk from 17 Apr 1943 to 17 Aug 1944. Warrant Officer Ernle Kyrle Money (b USA), Basilisk (BDS) 24 Feb 1944 to 1 Mar 1945. An antisubmarine boom net was installed across the shipping channel between Paga Point and Gemo Island (as shown on the map above). The net was supported by floats. Small motor launches were used to drag the boom to one side to allow shipping to pass through. This was a vulnerable time for the port as Japanese Midget submarines were known to follow submerged closely behind an entering vessel and avoid the boom. This happened in Sydney Harbour in May 1943. The photos below show the boom being operated. Another photo of the Paga Point boom. 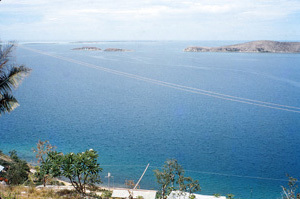 The two humps of Lolo Rua Island can be clearly seen to the left of Gemo. 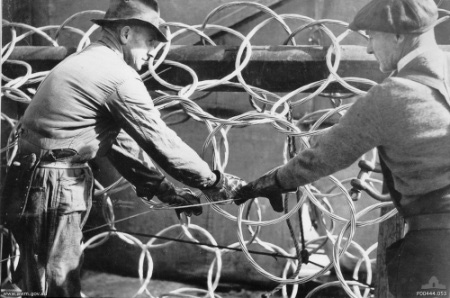 Boom net being constructed in Sydney, Australia. The following photos were taken by John Douglas and are copyright (email: dougal@daltron.com.pg). They show Paga Hill as it is today. 1. From Paga Hill looking south towards Daugo (Fishermens) Island and Basilisk Passage (to the left) in the far distance. The two humps of Lolorua Island and the southern end of Gemo Island can be seen to the right. This is the main shipping channel into Port Moresby and the one defended by Indicator Loops and 2 x 6" gun battery on Paga Hill. In 1956, my father Robert Walding was appointed as an electrician to the Steamships Trading Company (STC) workshop at Port Moresby. 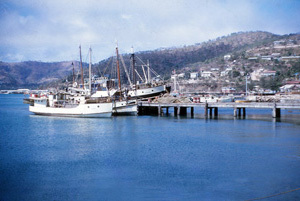 Some of the photos he took of the harbour in September 1956 are shown below. His Kodachrome transparencies have retained all of their brilliant colour over the past 50 years. Kodachrome always did emphasise the blues. They are copyright. I have boxes of his Anscochrome slides which have faded to nothing but a purple fog. 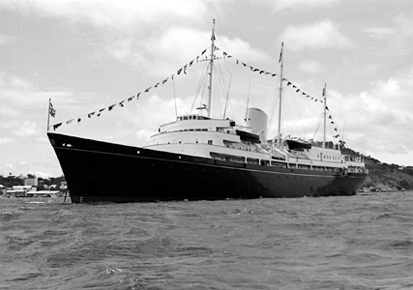 In 1956 STC was the junior brother in the triumvirate of Burns Philip, W.R. Carpenter and Steamships. 13. 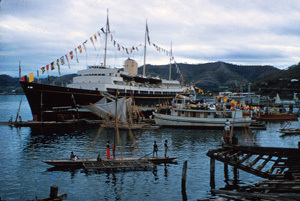 Royal Yacht Brittania at Port Moresby 14. Lolo Rua (or Lolla Rua) islands (left) and the southern tip of Gemo Island (to the right). 17. Jackson's Airport 1956. 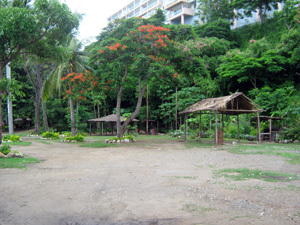 The airport is 11km from the centre of Port Moresby. At the start of the Japanese bombing campaign, it was one of their principal targets. 18. Ela Beach 1956. Taken from Paga Point, facing east towards Koki. If you have any further details of Port Moresby harbour defences or antisubmarine harbour defences in general (Indicator Loops and Harbour Defence Asdic) that may help with this research project please email me at the address at the top of the page.